Comes from trees that were harvested many years ago. These trees were 200 to 500 years old. Now most heart pine comes from reclaimed lumber sources old barns, mills, public buildings, old subway structures and even found sunk in riverbeds. Old dock pilings and bulkheads make beautiful heart pine floors with unique color and tone .Heart Pine comes from the center section of the Pine tree. Slow growth of the tree produced a tight-grain and is the most dense. 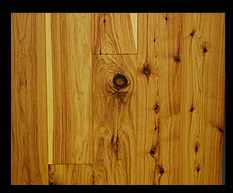 Heart pine is graded according to heart content and knot size. Heart can be seen by the amount of red in the material. More red more heart content. All grades will have nail holes except river-recovered. River-recovered wood is Superior to all heart pine woods due to it being perfectly preserved in pristine condition. (75-85% vertical grain depending on width) 98-100% heartwood, Knots are not over 1 color is rich red, nail holes are average 15 per 100sq ft.
Vertical 98-100% heartwood, knots are not over 1 , color is rich red, nail holes are average 15 per 100 sq ft. These trees are younger in age and is typically where new pine flooring is acquired today. The same characteristics apply to New heart pine as stated above. Grading is done by the amount of heart content. This exotic wood is located in Brazil and throughout continental tropical America as well as in parts of the Lesser Antilles. The heartwood of ipe ranges from olive brown to blackish, though it can have lighter or darker striping that is sharply demarcated from the whitish or yellowish sapwood. Ipe is a low-luster wood with an oily appearance, a fine-to-medium texture, and a grain that ranges from straight to very irregular. This wood is the hardest of all on the JANKA scale. Brazilian cherry is a large canopy tree, sometimes reaching a height of 150 feet in the natural rainforest, with a cylindrical trunk up to 6 feet in diameter and a clear bole of 60 to 80 feet. The tree has a smooth gray bark that exudes a gum sometimes used for medicinal purposes. 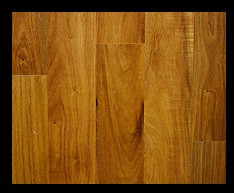 Brazilian cherry is a very beautiful reddish brown wood, with an interlocking grain and a golden luster or glow beneath. It is a hard, heavy and very strong wood. Is found predominately throughout Asia Natural bamboo is pale yellow in color, while the carbonized variety of bamboo is more brownish-yellow in color. 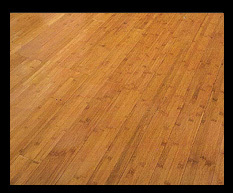 As a service to our customers, we can obtain a wide variety of other colored bamboo flooring as well. The species has a very linear grain and is fairly smooth in texture. 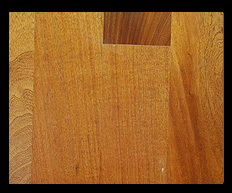 Found in Central and South America The sapwood of cumaru is very similar to the heartwood, which ranges from tannish to deep brown in color. Over time the color of Brazilian Teak (as it is sometimes referred to) will "flatten out" slightly. The species has an irregular, slightly interlocked grain and is coarse and wavy in texture. Is located in Latin America, mainly Brazil, Paraguay, and Uruguay. The sapwood of tigerwood is brownish-white to dirty gray, while the heartwood is reddish-brown to light golden-brown in color. The species has a mottled, wavy or interlocked, irregular grain. 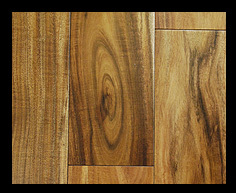 Tigerwood has a medium to dull luster and is fine in texture. Is found in West and East Africa, from the Ivory Coast to the Cameroons and eastward through Zaire to Uganda. The sapwood of sapele tends to whitish or pale yellow and is distinct from the heartwood, which ranges in color from a medium to dark reddish or purplish brown. Sapele is lustrous and fine-textured, with an interlocked grain that is sometimes wavy, producing a narrow, uniform roe figure on quartered surfaces. When cut, it has a cedar-like scent. Has a wide distribution, from southern Mexico southward through Central America down to Argentina. The very fine and even texture of this well-known and popular hardwood, along with its striped figuring, complements the attractive dark reddish brown color of mahogany wood flooring. The white sapwood is sharply demarcated from the heartwood. 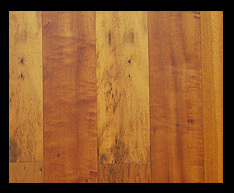 The grain of mahogany is typically interlocked, and the surface can have a medium to high luster. When freshly cut, it has a pleasant spicy scent. 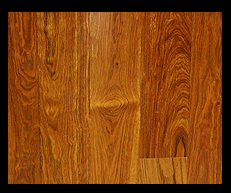 Wenge is found in Central Africa, especially throughout the Congo and southern regions of Tanzania and Mozambique. When freshly cut, the heartwood of wenge (millettia laurentii) is a yellow-brown color, but then in a few months it darkens to a deep, uniform brown, almost black, with alternate layers of light and dark tissue, forming a decorative figure. So it is important to buy well-aged wood before laying the floor. Clearly demarcated from the heartwood is the yellowish-white sapwood. This coarse-textured wood has a straight grain. A related species from East Africa, panga-panga (millettia stuhlmannii) has similar graining but does not darken as much as wenge. One of the best known of the exotic dark woods, wenge is used primarily where a bold dark color or contrasting light and dark accent strips are desired. Acacia includes more than one hundred species of trees and shrubs which are found primarily in the arid and semi-arid regions of the world. The slanted flat tops of Acacia trees make them conspicuous in the desert. Because of the slow growth of the tree, the wood is extremely hard and dense. Janka Test rating of 2400). The heartwood is dark red-brown and attractive when polished and is resistant to decay. This is because the tree deposits in the heartwood many waste substances which are preservatives and rend the wood unpalatable to insects making the wood dense and difficult to be penetrated by water and other decay agents. The sapwood of teak is white to pale yellow, while the heartwood is dark golden-brown to dark golden-yellow to rich brown in color with darker chocolate-colored brown streaks. The species has a straight, occasionally wavy grain and is fairly coarse and uneven in texture. The wood itself can be greasy with shiny white pockets. This species has a dull luster. Teak has a high resistance to decay and termite attack. In fact the oil secreted by the wood is reported to be a natural insect repellant. The wood remains smooth under friction and is reported to have the odor of leather when freshly cut. Chestnut is difficult and time consuming to dry properly. 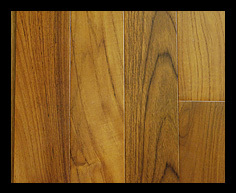 As a flooring option, teak is a somewhat hard and durable wood. It falls between black cherry and black walnut in hardness, is about forty percent harder than Douglas fir, is thirty-one percent softer than sugar maple, is roughly sixty-nine percent as hard as hard maple, and is just over forty-five percent as hard as santos mahogany's ranking of 2200. 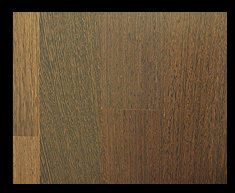 Bolivian rosewood is distinctive for its dark brown to violet color with black streaks or striping. Over time, the wood may lighten considerably from darker brown tones to lighter golden tan colors. In addition, the broad color variation exhibited in freshly cut wood can undergo substantial muting over time. It has a uniform and moderately coarse texture. 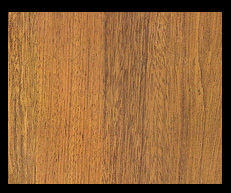 Brazilian rosewood is notably hard and dense, with a dimensional stability similar to that of red oak. 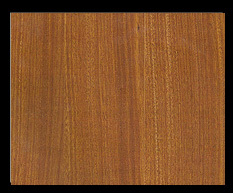 Brazilian rosewood is nearly ninety-seven percent as hard as pecan or hickory, is roughly twenty-two percent harder than hard maple, about eight percent harder than wenge, almost exactly thirty-eight percent harder than red oak, and is roughly eighty percent as hard as santos mahogany's ranking of 2200. Despite its density, Bolivian rosewood works well and sands to a fine natural polish. Many oil-based finishes will not dry properly with this wood, so water-based stains are preferred.